People don’t mean to abuse their electronics and other possessions, but in a hectic, crazy world, it is easy to drop a sensitive laptop, tablet, or other device onto a table, chair, or even on the floor. Over time, all these bumps and bruises can add up, causing the device to break down. Of course, when this happens, you can bet that the customer isn’t going to take responsibility for their own rough handling. They’ll blame the manufacturer! You can help extend the life of your electronic products with a very simple and low-cost measure. Simply add rubber bumpers to the bottom of your product. Budwig’s thermoplastic rubber bumpers offer excellent shock absorption, taking the beating so that your product doesn’t have to. The longer your products live, the happier your customers will be. 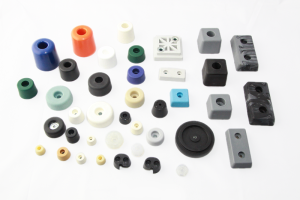 At Budwig Molded Products our rubber bumpers come in different sizes and colors to best match your product. Contact us to learn more.